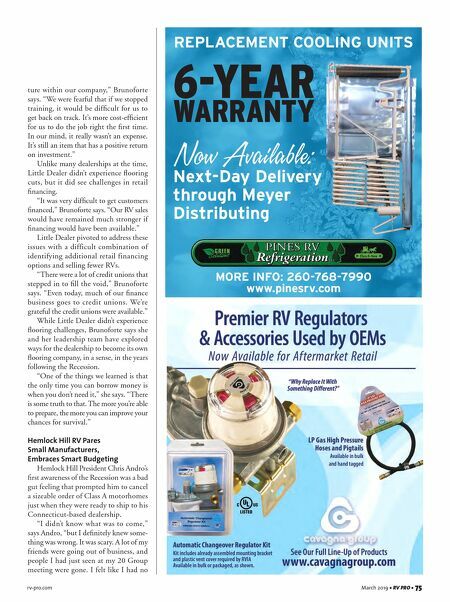 74 • RV PRO • March 2019 rv-pro.com D E A L E R S than 6 acres, consolidating operations that were located on two sides of the highway into a single location. "This has given us the ability to have all our inventory nicely displayed," Sutton says. "It's easy for consumers to come in and see what we have. After 21-plus years of dealing with a patch- work of lots, we finally have everything laid out with frontage on two streets. Our corner is Eugene's second-busiest intersection. ... This has made a huge difference for our dealership and has been a big blessing." 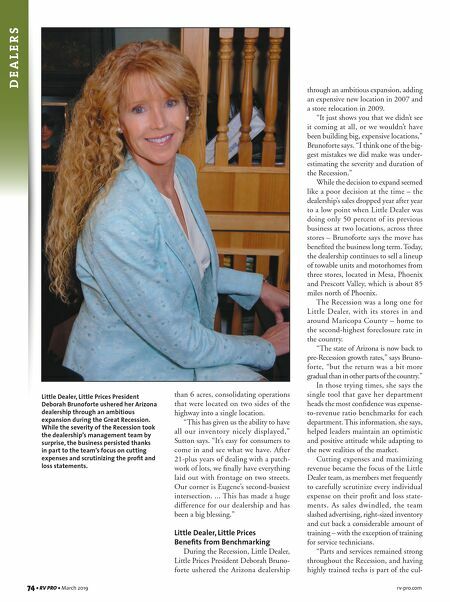 Little Dealer, Little Prices Benefits from Benchmarking During the Recession, Little Dealer, Little Prices President Deborah Bruno- forte ushered the Arizona dealership through an ambitious expansion, adding an expensive new location in 2007 and a store relocation in 2009. "It just shows you that we didn't see it coming at all, or we wouldn't have been building big, expensive locations," Brunoforte says. "I think one of the big- gest mistakes we did make was under- estimating the severity and duration of the Recession." While the decision to expand seemed like a poor decision at the time – the dealership's sales dropped year after year to a low point when Little Dealer was doing only 50 percent of its previous business at two locations, across three stores – Brunoforte says the move has benefited the business long term. Today, the dealership continues to sell a lineup of towable units and motorhomes from three stores, located in Mesa, Phoenix and Prescott Valley, which is about 85 miles north of Phoenix. The Recession was a long one for Little Dealer, with its stores in and around Maricopa County – home to the second-highest foreclosure rate in the country. "The state of Arizona is now back to pre-Recession growth rates," says Bruno- forte, "but the return was a bit more gradual than in other parts of the country." In those trying times, she says the single tool that gave her department heads the most confidence was expense- to-revenue ratio benchmarks for each department. This information, she says, helped leaders maintain an optimistic and positive attitude while adapting to the new realities of the market. Cutting expenses and maximizing revenue became the focus of the Little Dealer team, as members met frequently to carefully scrutinize every individual expense on their profit and loss state- ments. As sales dwindled, the team slashed advertising, right-sized inventory and cut back a considerable amount of training – with the exception of training for service technicians. "Parts and services remained strong throughout the Recession, and having highly trained techs is part of the cul- Little Dealer, Little Prices President Deborah Brunoforte ushered her Arizona dealership through an ambitious expansion during the Great Recession. While the severity of the Recession took the dealership's management team by surprise, the business persisted thanks in part to the team's focus on cutting expenses and scrutinizing the profit and loss statements.